Jesuit priest Bob Carter’s obituary appeared in the New York Times on March 15, 2010. He was 82 when he died. I hadn’t heard about him in years, even through grapevine gossip from old Dignity friends. Probably the last time I saw him was in the early ’90s at a Dignity event. I was part of a panel for Dignity New York’s 20th or 25th anniversary. They invited all the “outlaws” and other colorful characters from the past to bring their remembrances. Andy Humm was there and a member of the panel with me. I remember I sat next to John McNeill. I dressed up. It was probably the first and only time I was in a skirt at Dignity. Bob Carter must have been on the panel, too. He was very much in the same mold as McNeill. He was a strong voice for gays in the Church, but “gay” meant “gay men.” McNeill didn’t have much use for women, and neither did Bob Carter. McNeill had, as I recall, had one tiny section dedicated to the issues facing lesbians in the Catholic church in his famous and seminal book, The Church and the Homosexual. McNeill said, “I don’t know very much about lesbians, so I can’t write about them.” Unfortunately, he didn’t try to learn either. Mainly, I think, because women weren’t part of his life and he wasn’t particularly interested in them or struggles relevant to them, namely inclusive language and priesthood. A lot had changed since those heady and turbulent days of the ’80s. Many Dignity members from that time had died from AIDS. Dignity had changed a lot of its language and attitudes to be more inclusive and welcoming of lesbian Catholics. Being thrown out of St. Francis Xavier Church had an impact. Not being able to congregate in a Catholic church with other priests, ex-seminarians and gay Catholic men helped to torpedo the homophile aspect of Dignity and bring them out into the wider world of outsiders. Once that happened it became a friendlier place to women, although it’s still mostly men. However, that’s not Dignity’s fault. By the late ’80s and 1990s most Catholic lesbians had given up on organized religion as too sexist and homophobic. The Times obituary was a very good article on Carter and there is little I can add to it. You can read it here. A picture of him marching in a gay pride day parade in full Roman collar with three other priests was used in the obituary. I would guess that photo was taken in 1981 or 1982. I remember it well — I was marching with them as part of Dignity New York. Besides Bob Carter and Fr. McNeill, Fr. Bernie Lynch marched in his collar, and another priest from Dignity who I recognize, but can’t member his name. I recall that he was a nice guy. I can’t emphasize enough how incredibly brave it was for those four men to march at the head of the Dignity chapter in full Roman collars. It was a deliberate statement: we are Catholic priests. We are ministering to and members of an organization dedicated to full inclusion of gays in the Church. That active clergy expressed solidarity with gay and lesbian Catholics (just as Sr. Jeannine Gramick and Fr. 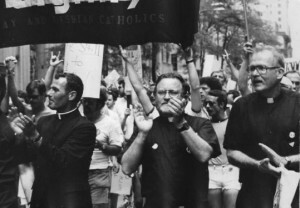 Bob Nugent did with New Ways Ministry), gave heart to a generation of gay Catholic activists, their families and friends, and lent a certain credibility and sanction to efforts to change the church. I will always remember that march, and the applause and roars of approval as the Dignity banner was proudly carried down Fifth Avenue to the Village. The four priests and Dignity group were applauded the entire line of the march. We applauded back at demonstrations of support. That statement was vintage Bob Carter: the bravery and the homophile self-centeredness. That is what the men Bob Carter ministered to in the ’70s and ’80 wanted more than anything–a church that would accept them totally for who they were. For the most part, they were faithful, devout, traditionalist Catholics in every way – except for the fact that they were gay. So I applaud Bob Carter for the work he did. I just wish he would have taken his gay activism up a notch to address the injustices lesbian Catholics had to face – the lack of access to power, and the lack of visibility in liturgical language. As a Dignity New York board member, Bob Carter approved women speaking from the pulpit, so long as their sermons were called “non-homilies.” The homily was only reserved for priests. Gay or not. Thanks for this personal memory. I had never heard of Bob Carter before reading the obituary, but of course I know John McNeill from his books, and more recently from email correspondence. Bernard Lynch is well known and admired among our Soho Masses congregation for his courage and and openness. He doesn’t hesitate to introduce himself as a Catholic priest, married to his husband – which sometimes raises eyebrows, and does nothing to endear him to the diocesan establishment. The point you raise about the male bias in Dignity and in some writing by male authors is an important and troubling one, for which I don’t think there are any easy answers. Our Soho Masses do try consciously to be completely inclusive, and have a gender balanced organising team, but attendance is still more male than female, especially when it comes to additional events outside of the Mass itself. I suspect that some lesbians are at least as interested in women’s issues as in gay issues, which will work to reduce their participation in the first place. Thereafter, the lack of a gender balance will potentially put off some other women, and so some degree of numerical imbalance is almost inevitable. Dear Terence, Good to hear from you! The issue of female participation in Dignity and other gay Catholic groups isn’t easy to resolve, I agree. If somehow or another a chapter or local group can get a core of women – 10+ as regulars, then women visitors will be encouraged to stay and become part of the group. What happens is that–even though the men and women regulars are welcoming and warm–a woman visitor will see 1, 2, or 3 women and decide this is not for her–there are not enough women. At this point in our history, many Catholic lesbians do not affiliate with any organized religion. Some, like myself, are members of a Catholic parish that doesn’t have a gay ministry close by. Some women who belong to parishes are closeted, and would be afraid to go to a group like yours. For others, and this would be me, too, have serious demands on their time; so if I go to Mass regularly and volunteer for a parish ministry, I have no time for anything else. This is especially true of lesbians with children. As more and more parishes become at least open to gay and lesbian membership, gay and lesbian groups will lose membership. Dignity’s ultimate goal – I remember – was to cease to exist because everyone was truly “welcomed home.” Here is one possible suggestion to attract women members or regular visitors – offer a day of retreat, artwork (like making a mandala or labyrinth) or meditation. A emphasis on “spirituality” vs. “religion” may be less threatening or overwhelming to someone trying to come back in. One last thing – it has been my experience women go to religious groups to find a spiritual community but also to find a potential lover. That is why having a group with singles as well as couples is important. Be well. All the best. Please remember me to Bernard Lynch!